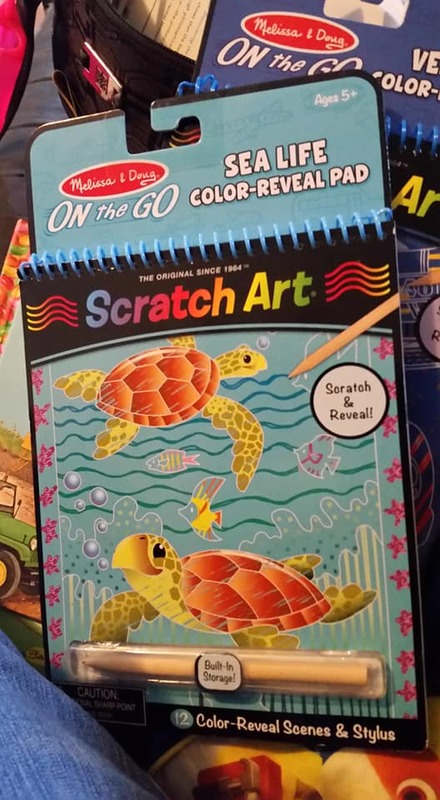 Scratch Pads. These sheets cause very little mess and instead of a bunch of crayons, it comes with a single wooden scratch stick. 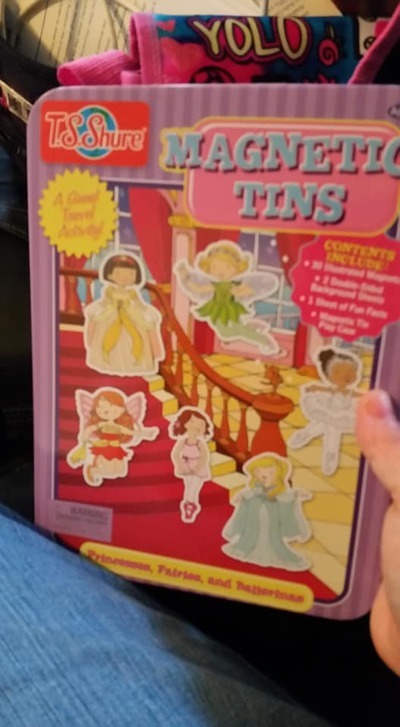 My oldest spent a good hour on these when we first got them. You can buy them with pictures printed on them or blank and the kids can make their own colorful picture. Lots of fun and plenty of styles to choose from (you can even catch these at Dollar Tree!). Water Wow Pads. These things are amazing. You just fill the “pens” with water and the colors appear on the paper. It is reusable and it keeps the car clean. These also come in a variety of themes to choose from. Reusable Sticker Pads. These are great for many ages. 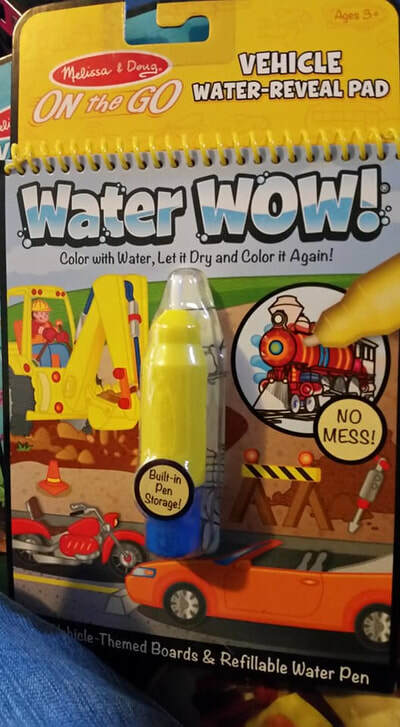 Even toddlers will enjoy these and will be entertained for a significant amount of time. Magnetic Play Set. Reusable and come in their very own container already. They have dress up ones as well as various scenes with people and objects. Portable Game Systems. We have a Nintendo DS and a portable Atari for our kids. They love playing these so much that we have to establish time limits for them. These systems we got for around 20-30 dollars each. They love these older, cheaper systems just as much as the new ones that are out and its not the end of the world if they break one on accident. 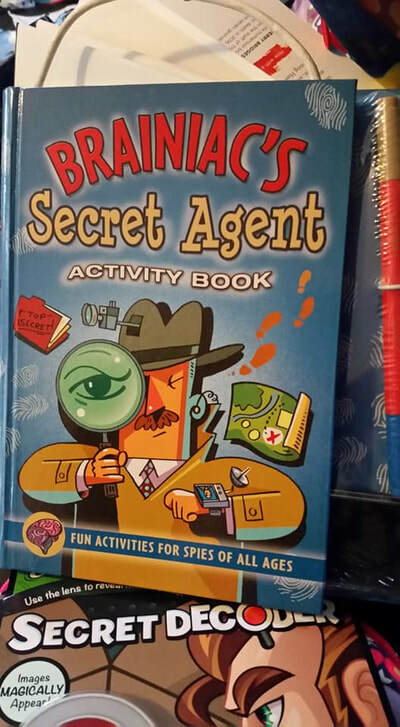 Secret Decoder books. My girls are really into secret codes and anything spy or ninja related. These books satisfy that desire to pretend to be on a secret mission from the comfort of their car seat. Books. These can be absolutely free if you get them from your local library. Try and be careful with regular books though. My kids have dropped theirs on the floor and someone stepped on it and torn out some pages. Another idea would be to have some chapter books you could read in the car to everyone. And do you remember when you could buy books with a cassette and follow along with the story? They still exist! And they have a collection of books on compact disc for those who have moved forward technologically from the cassette player. Put it in the cd and let your child read along in the car to their favorite stories. Radio Shows. My husband downloaded a radio program called The Radio Adventures of Dr. Floyd. Our whole family loved listening to these short programs as we travelled together. A couple of other good programs to listen to would be Adventures in Odyssey and Jonathan Parks. No Mess Markers and coloring books. These things are great! While I wouldn’t list them as my cheapest item for road trip activities, they keep the car clean which keeps parents from stressing. So, there you have it, our 11 ways to keep the little ones entertained on road trips without destroying the car. If you know of an inexpensive and clean way to occupy the kiddos on long car rides, message us and let us know. What in the world are you clinging to??? We see in this passage of Scripture a man coming to Jesus to ask about what is necessary for salvation and Jesus responding to this question. What a great question to ask the Messiah whom God the Father foretold would come and bring salvation to man! This is a vital question for every man because it tells how to escape judgment and be restored into a right relationship with God. This should have been a joyous moment for the man. However, we see at the end of the passage, the man did not respond to Jesus’ answer with delight, but instead with sorrow. Why? Because he loved his wealth. To put it bluntly, he loved his possessions more than God. Think about it. He left sad at the thought that Jesus had told him to sell what he had to gain eternal rewards. Jesus exposed this man’s love for material riches. And what would he have gained with obeying Christ in this? Eternity in heaven, sweet communion with God, peace and so much more. He would have gained a treasure which he could never lose and which is far more valuable than all the riches in the world. Which of these two is the greater possession? We can look at this gentleman and think him foolish, but let me pose a question to you, reader: Is there anything you would even hesitate to let go of if the Lord would ask it of you? What if you needed to give up your home, your job, your freedom, some leisure activity perhaps? Are you willing to truly forsake everything and follow Him, even unto death if necessary?